Geraint Thomas produced a solo ride that nearly looked to be a winning one on Sunday in the Milan-San Remo one-day monument. The Welshman rode solo on the final Poggio climb, only succumbing to the chasers at the top with 5.5 kilometres to race to the Via Roma finish. Thomas worked for teammate Ben Swift over the Cipressa and when the moment came, struck clear with rival Daniel Oss of team BMC. The pair had 17 seconds over the group at the base of the final Poggio climb and after dropping Oss, Thomas maintained a 12-second gap mid-way up. Thomas shocked many followers with his ride. When the race left under Milan’s rain, they talked about Ben Swift, third in 2014, or Omloop Het Nieuwsblad victor, Ian Stannard, but not much about ‘G’ Thomas. After the Turchino Pass and arriving on the seaside in Liguria, Thomas appeared to be one of the team players, not Sky’s possible winning card. 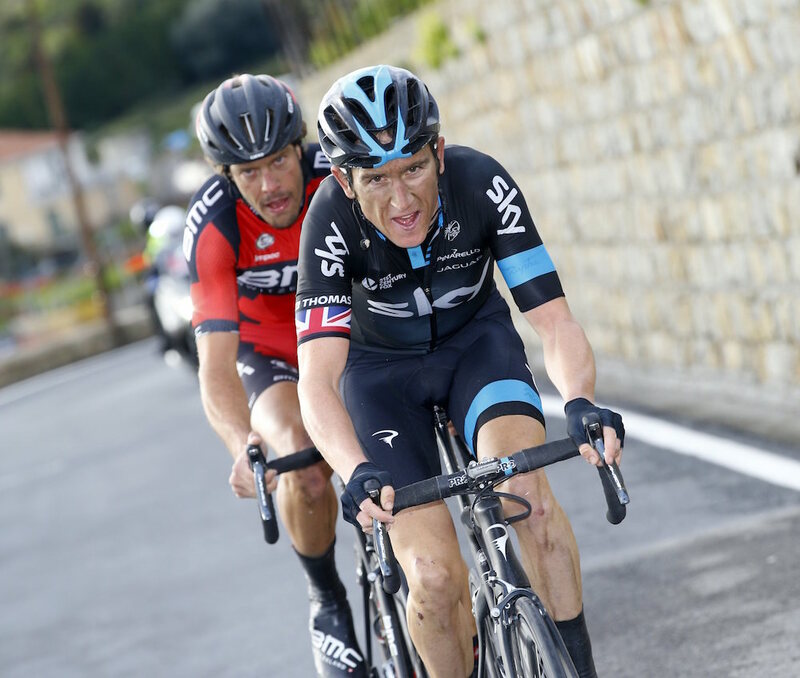 He rode with Lars Petter Nordhaug, Andy Fenn, Ian Stannard and Salvatore Puccio. With Sky’s black train at full speed, Puccio slipped and fell on the descent of the Capo Berta. The game began to change. On the Cipressa, Nordhaug put in his last effort and turned to Thomas and Swift. When Oss broke free on the flat between the two famous closing climbs, Thomas noticed. “I was supposed to wait until the Poggio, but when I saw Oss go you could see how strong BMC were and it was kind of just instinct to follow. I could have waited, but it was just in the heat of the moment you just race,” Thomas said. Thomas recovered as much as he could and when the descent off the Poggio finished, he went to the front on the flat road that leads around the fountain and into the heart of San Remo. Swift finished 13th in the Classic and will now go on to race Coppi e Bartali and País Vasco while Thomas will take aim at E3 Harelbeke, the Tour of Flanders and Paris-Roubaix along with Bradley Wiggins. “Hopefully I can make use of [this form]. 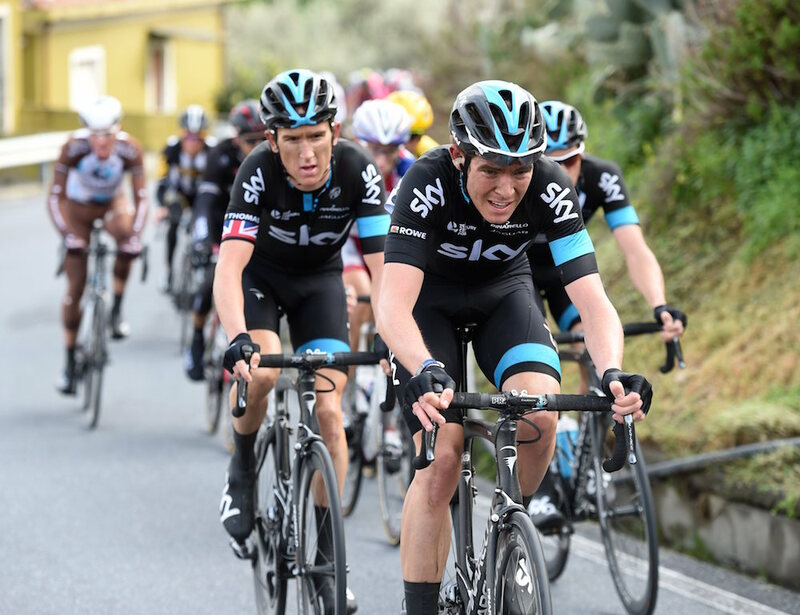 I was really disappointed in Paris-Nice, I was proper gutted,” Thomas said.